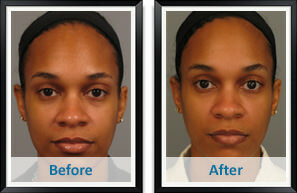 Structural fat grafting is a natural means to enhance and rejuvenate the face and body. As we age our underlying collagen and elastic begins to break down and wrinkles and folds emerge. This along with facial fat loss and the fact that our skin, muscle and bone all decrease in thickness and size, brings about deep facial lines and hollow appearance to the face. Fat grafting is a cosmetic procedure where your own fat is used to re-contour your face and provide definition to your cheeks, chin, jaw-line or lips, and/or correct problems such as hollowness around the eyes or acne scars. Structural Fat Grafting is performed as an outpatient procedure under general anesthesia or IV Sedation. This procedure takes between 1 to 2 hours, depending on the amount of fat grafting needed to the area. During this procedure fat is gently removed from the donor site (usually the inner thigh, buttocks, abdomen or the saddle bags) with a small hypodermic needle using a special cannula with limited suction as so not to damage the membrane of the fat cell. The fat is then spun in a centrifuge to remove excess fluids and the damaged fat cells are picked out and only whole, undamaged fat cells would be used. The fat is then injected with the use of a separate smaller hypodermic needle either just under the wrinkle or deep within the muscle in some areas where there is a higher vascularity within the muscle increasing the longevity of the fat graft. Following the procedure you can expect to be swollen, a bit bruised, and a little sore both at the treatment site and the donor site. You shouldn’t wear make-up until at least 1-2 days after. You should keep the treatment area as still as possible for the first few days to allow proper healing and give the area and newly transplanted fat cells a good chance to become vascularized. Avoid high-impact exercise or activities for the first 2 weeks, depending upon the extent of the surgery.